Candles are one of those things, you either love them, or just don't care about them. I used to always think they were some sort of gimmick, something that came with the territory of women that love sitting in the bath for long enough to make your skin appear like you've aged 30 years. 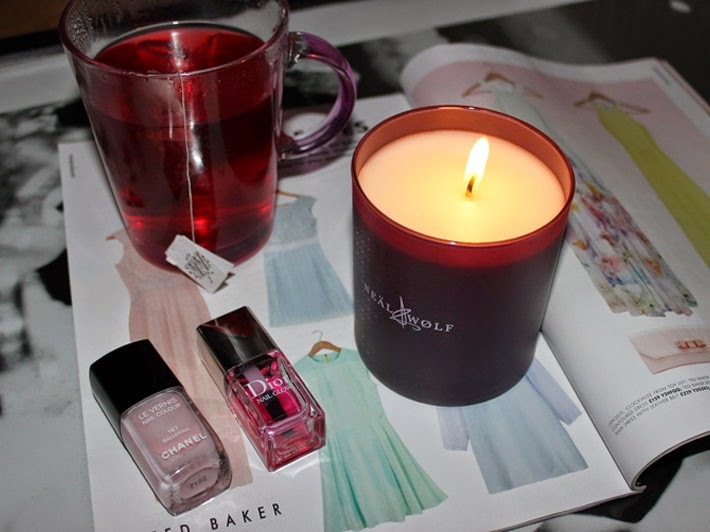 But now I've become one of the women that LOVE candles, granted, I don't have a bath, but I have a candle. On a sidenote, it IS Friday, I apologise for the rambling, and more-so the spelling of "gess" in that GIF, evidently people that spend too much time on the internet are the worst at spelling. The scent itself, boasts a "true indulgence" with aromas of mandarin and orange blossom which turn into the floral notes of lily, ylang-ylang and orchid, and importantly, isn't too overwhelming and slowly releases its scent to fill the room with the beautiful scent of Neal and Wolf. The first burn of this candle did take about 6 hours to get no rings in the wax, but afterwards, it tends to take about 3/4 hours, giving you enough time to binge watch Breaking Bad and scoff leftover Easter eggs. I tend to have this burning from late evening and blowing it out just before bed leaves me feeling relaxed and ready for sleep, without having overwhelming notes of lavender like most candles for relaxation. Yet another occasion in which Neal and Wolf have truly impressed me, they are an amazing company, with fantastic products at reasonable prices. As if I wasn't already converted, I can see me buying a LOT more by this brand.